I’ve heard the name mentioned on a number of occasions. Most of the time I hear it after graduation when folks are talking about where they are going to have lunch. With that in mind we decided to give it a shot for lunch…no graduation involved. Easy to spot with the trademark glasses on the awnings over the window we stepped inside and into the past. 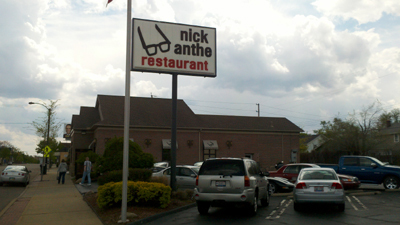 Nick Anthe’s has a dated feel to it…much like Gus’s Chalet but not as severe. Dark wood, mirrors and burgundy booths give the place the feel of a refined and clean trip in the way-way back machine. Much like Gus’s however we were easily the youngest folks there for lunch. The menu features a lot of standards and appears to focus on seafood and beef. Our server was pleasant and observant and kept up with all of her tables during our visit. She started by bringing us a basket of bread which was fabulous. 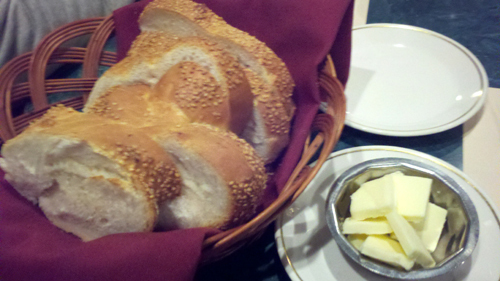 An Italian style loaf with sesame seeds toasted on the crust, the bread had a soft and luscious interior and a slightly bitter and crispy crust. 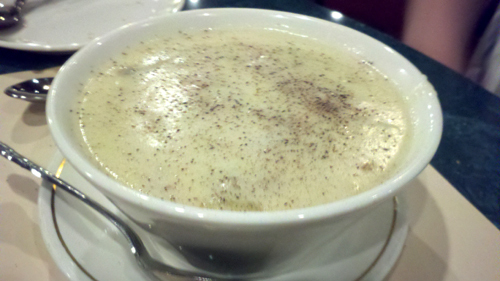 My brother started with a clam chowder (New England) which was rich and superlatively creamy. As he worked his way through the soup he found a lot of clams floating alongside the veggies. 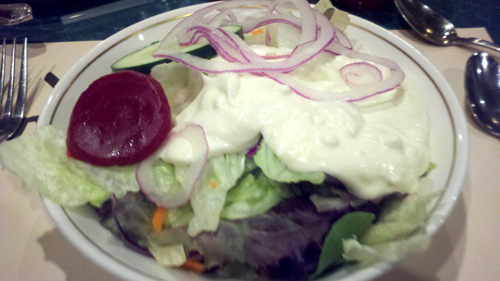 We both got salads which were pretty standard but on a hunch I ordered Bleu cheese dressing which turned out to be exactly what I was hoping for. Thick as paste and lumpy with cheese…perfect. John ordered an open-faced chopped steak sandwich, Steph went with the sirloin steak and whipped taters and I opted for the broiled Sole ala Anthe with hashbrowns. Steph described the sirloin and taters as boring and to some degree they were. 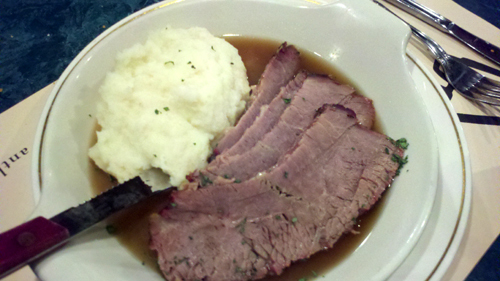 The meat was tender and juicy and the potatoes were fine. 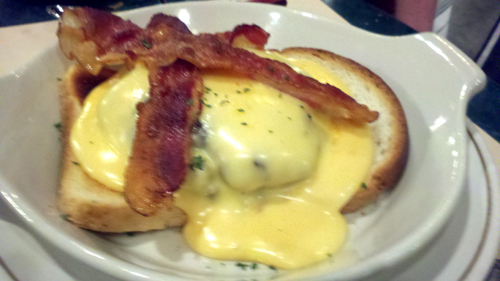 John’s sandwich instantly reminded me of Kentucky Hot Browns with a chopped steak replacing the standard turkey. It did have bacon and something very close to a Mornay sauce atop it that completed the reference to the Kentucky artery clogger. The ala Anthe means stuffed with peppers, spinach, crab, greens, shrimp and I’m not certain what else. 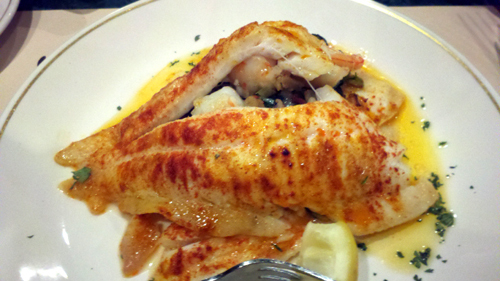 The fish itself had a dusting of spice, mostly paprika, and include all four filets from the flat fish. Not a bad deal for the price. It was also well prepared, just done through and flaky. The stuffing had a mélange of different peppers and large chunks of seafood which did a nice job complimenting the fish. 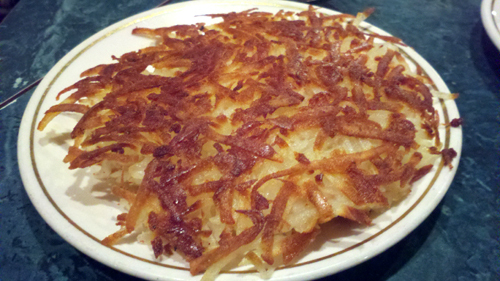 The hashbrowns definitely deserve their own mention. Nothing unique just very well prepared with a hard brown crust on the top and steaming billowy shards of potato beneath. I don’t know exactly why I chose that option but I was glad I did. Nick Anthe’s is certainly dated. It might even be outdated. But they do take time with their preparation and deliver some very solid classic dishes that you don’t often see anymore while avoiding the complete throwback feel of Gus’s. And the food is much better here. If you are considering a classic night out you could do a lot worse.